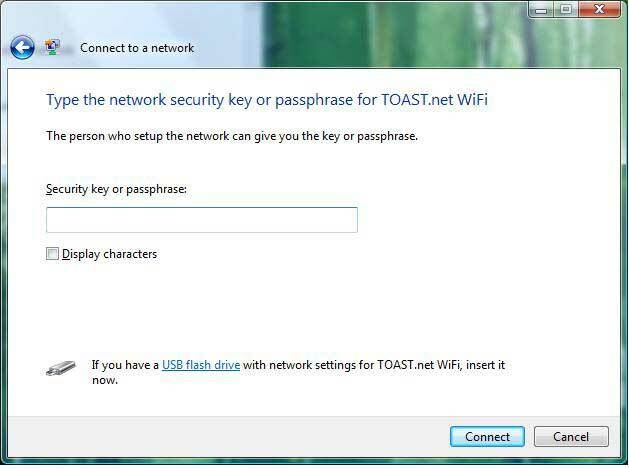 *Note that TOAST.net can not provide technical support for 3rd party wireless routers and devices. The device manufacturer should be consulted for configuration assistance. Double click Wireless Network Icon on the lower right side of the Windows Tool Tray. Click on your wireless network. Enter your given Wireless Password, and confirm the password if prompted. 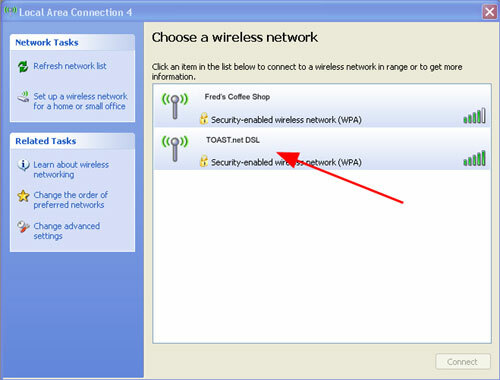 Windows will indicate you are connected to your wireless device. You should now be able to access the Internet. Click on Connect to a network on the menu. -Make sure the Show menu is set to Wireless (1). 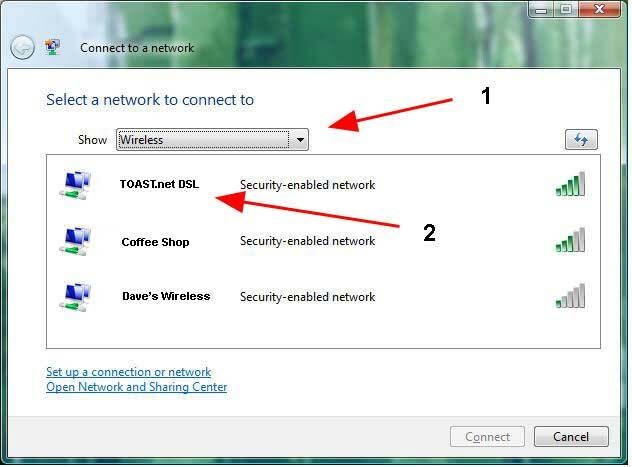 -Double click on your Wireless Network.(2). Enter your given Wireless Password. Windows should display a screen showing you have successfully connected with your wireless connection. You should now be able to access the Internet..
Click on the "Wireless" icon in the lower right corner of the Windows Toolbar. Select your wireless network and click the Connect button. Enter your provided wireless password when prompted. You should now be able to access the Internet. Click on the wireless network you wish to connect to. Make sure Connect automatically is checked, and then click Connect. Click on the Connection icon located in the System Tray. Enter the wireless password supplied with your device. Click Next. On the upper-right side of the top Toolbar, click the "Wireless" symbol. A list of available wireless networks will be displayed. Choose your wireless connection. When prompted, enter your assigned Wireless Password, then click Connect. You should now be able to connect to the Internet.